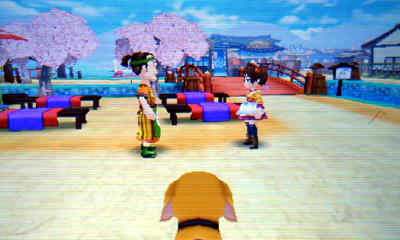 After changing into a dog, go for a stroll "around the teahouse"
You spot Komari and Ginjiro outside the tea house, where she is confirming that she finished the task that Ginjiro assigned to her. Komari seems nervous though and isn't making sharp remarks back at her dad like she usually does. Well, he's not going to complain about it! Ginjiro heads back to the Tea-ful Reunion to make Komari some tea and snacks. After he leaves, Komari sighs with relief. Suddenly she turns into a tanuki! The little guy is relieved that the human was none the wiser with its disguise and mocks the old man for not recognizing its transformation skills. You overhear Ginjiro talking to the real Komari as she returns from her break. She already ate the snacks that Ginjiro was going to set aside for her. Hey wait a second... if Komari is here... Ginjiro wonders who he was talking to earlier. The tanuki makes a quick escape before it gets caught. In Japanese lore, the tanuki is a clever little animal that is known for shape-shifting and disguises.